As editor-in-chief of Glamour magazine, Cindi Leive ’88 commands an audience of 12 million women every month. It’s a winning formula. 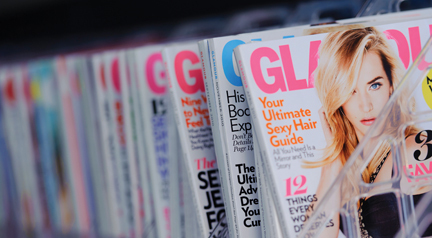 Under Leive’s editorship, Glamour has won three National Magazine Awards, including the highest honor, the award for General Excellence, in 2005. In 2007, the magazine won for Personal Service for an article titled “What No One Ever Tells You About Breast Implants” and, in 2010, Glamour received the newly created Magazine of the Year Award, which recognizes a magazine that excels in both its print and digital formats. Leive landed an editorial assistant job at Glamour after college, but she planned to attend graduate school in English. She received a Mellon Fellowship and decided first on Duke and then Columbia, but each time she would try to get up the nerve to tell her editor she was quitting, she would feel a pit form in her stomach. She ended up staying at Glamour for 11 years, climbing to the deputy editor position before accepting the editorship at Self. She returned to Glamour in May 2001 as editor-in-chief. She served as president of the American Society of Magazine Editors from 2006 to 2008 and is on the board of the International Women’s Media Foundation. Leive’s own stance toward the world is curiosity leavened by optimism—an attitude she associates with Swarthmore. “I’m still just such a big believer in the value of a Swarthmore-type education and the whole idea of being curious about the world and also looking at the world in an essentially optimistic way,” Leive says. 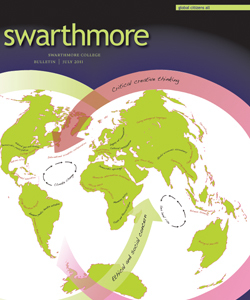 “Swarthmore really promotes critical inquiry, but I never felt like it was a cynical or a skeptical place. I always felt like it was, in general, filled with people who were sincere. At Glamour’s headquarters on a Friday in March, Leive’s editorial eye was constantly in evidence—whether it was noting typos during a meeting to review the iPad edition of the June issue or scrutinizing outfit choices for an upcoming road-trip–themed fashion shoot. For the photo shoot she suggested a pair of short shorts be replaced with a pair of skinny pants and inquired about the inclusion of affordable wardrobe items. “Is there anything genuinely cheap in here?” Don’t forget, she reminded the fashion editors, if in any picture it looks like the car is moving, the models must be wearing seatbelts. Leive had appeared on Today earlier that day to talk spring fashion trends—orange is (or was) in, as are wider-leg pants options; “hats are everywhere, if you dare.” She herself wore a sleeveless, lightly pleated poppy-red Tory Burch boatneck dress with gold button detailing, black tights, and high black platform shoes. (If you’re keeping score, she is in the platforms-are-good-for-the-world camp; “I’m 5 ft. 2 inches, so I think they’re a gift from God.”) Lining Leive’s 16th-floor Times Square office are pictures of her interviewing then-Senator Barack Obama and Senator John McCain during campaign 2008 and former President George W. Bush in the Oval Office. In another picture, she poses with Secretary of State Hillary Clinton, a past Glamour Woman of the Year winner. Leive joined Glamour as an editorial assistant “with some of the prejudice that one might expect from a Swarthmore graduate fresh out of seminars like Feminist Interpretation of Scripture.” She earned high honors in English literature; the Jesse Holmes Prize for the best essay on any topic in religion—for a paper about the power dynamics between Ruth and Naomi—and a Phi Beta Kappa key. As editor, Leive is not just in charge of the print magazine and the website (Glamour.com) but an expanding brand that encompasses special events like the Women of the Year Awards, a three-book deal with Hyperion (the first book, 100 Recipes Every Woman Should Know, came out in April), Glamour apps, a jewelry line with HSN, a partnership with match.com (Glamour Matchmaker), and a series of special newsstand editions. “The thing about Cindi is that she’s this combination of an incredibly confident, take-charge leader and the most likeable person you’d ever meet,” says Bernstein. “It’s infuriating!” he laughs. Which brings us back to the point that Leive wants you to feel good about yourself when you finish reading Glamour. “We always say that we want this to be a magazine that is going to make you feel better, not worse, about your life after you close its pages, that a woman should never read this magazine and feel like she’s not rich enough or thin enough or whatever enough to have a piece of this fantasy,” Leive says. Elizabeth Redden ’05 is a freelance writer and graduate instructor of writing at Columbia University. Watch Cindi Leive’s fall 2010 McCabe Lecture “Would Walter Cronkite Have Tweeted?”.